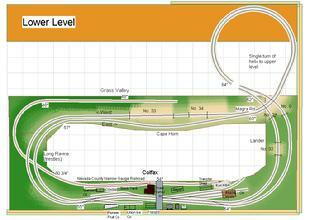 I am continuing the planning of the new layout - a recreation of the SP moving heavy freights over the "hill", Donner Summit. I have refined the pencil concept drawings by drawing them with 3rd Planit on my Mac (I used Parallels to run this normally Windows only program on my MacBook). I narrowed the decks to get more room in the aisles and to help uncover the lower deck at Colfax. 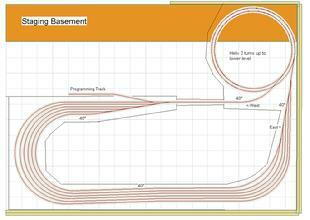 Starting with the "basement" staging level at 40", I have 6 double-ended staging tracks. I added a programming track where I will be able to do the DCC programming and to add and remove locos and cars to the layout. The programming track is on the outside of the fascia to make it easy to reach, as the rest of the staging is going to be awkward to access. Not shown on the plan are the removable clear plastic dust shields I will put around the outside edges of the outside of the staging area. The shed I am going to build the layout in is going to be hard to control dust in. I am also thinking of how I can keep the dust of the rest of the layout - perhaps with some clear plastic that rolls up and down like a window shade. The lower level is reached by two turns of double-track helix with 4" rise/turn and 30/32.3" radii. 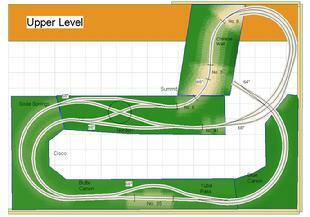 The outer track is the uphill direction to give uphill trains the advantage of the somewhat larger radii. 30" is the minimum radius of the layout. After traversing a short section wich will be sceniced with red dirt and pines to represent the Sierra foothills, we arrive in Colfax. Colfax is the one town and the main focal point of the layout operation-wise. Here helpers were added to trains and crews often took breaks to get lunch. The Colfax freight station is now shops with lots of SP memorabilia decorations that forms a small museum. Westbound UP freight rolling through Colfax. 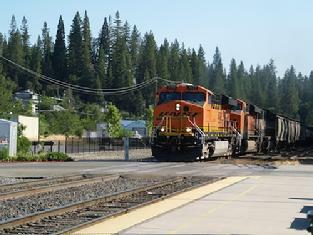 Shot from Grass Valley St grade crossing looking east. A big feature of the town will be an HOn3 shortline, the Nevada County Narrow Gauge Railroad which met the SP passenger trains stopping at Colfax until it was terminated in 1942. I am going to use modeler's license to keep it alive into the present day. I have several industries in town all modeled after real industries that were found in Colfax: a couple of fruit packers, an ice company, a stock corral, Oilville where oil for the narrow gauge railroad was transfered and a transfer station for the NVCRR/SP transfers. The narrow gauge will head east out of town, under the Long Ravine bridges and behind the hill. It will then have a short section on the far side to represent the rest of line that continued on to Grass Valley and then to Nevada City. I-80 now passes under the Long Ravine bridges where once the NVCRR ran. As the line heads east out of town it crosses Long Ravine on a pair of double steel trestles. 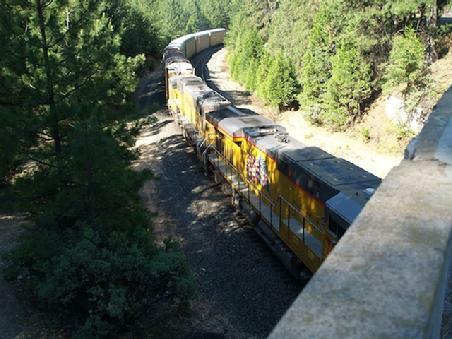 Once across the trestle we reach the Cape Horn area where one of the tracks goes into a tunnel and the other other clings to he edge of a long drop to teh American River valley. To ge the train back behind the backdrop I am going to have it disappear under the Magra Rd overpass. Eastbound UP train passing under Magra Road. A single turn of helix will bring us to the Upper Level. The separation between Colfax and the upper level will be 12" which is pretty minimal but will work because both levels are fairly high so that the viewing angle onto Colfax is fairly shallow and will allow average hieght people to see into the scene nicely. The upper level is going to be arranges so that you are looking up towards it due to it height. This will nicely imitate the prototype where trains are usually viewed from the roads below the line. The first stop on the upper level is Blue Canon which on the prototype is a town arranges around a 180 degree bend in the line. This will worknice for the corner of the layout. There isn't any switching here and most rains blow through this area. In the past steam trains took on water here and there were facilities for the crews to eat and sleep. Eastbound UP train between Yuba Pass and Cisco as viewed below from I-80. One compromise I had to make on the upper level is that the view point of the line from Yuba Pass onwards is from the wrong side. In the prototype at Yuba Pass the line passes over to the other side of the ridge. I just don't have the room to do the same on the layout. So scenes like this will have the train going downhill. A small issue that only the most avid Donner fans will probably notice. After climbing the long hill the train finally arrives in the Norden area. While not quite the summit, the grade is gentle after this point so the helpers can cut off. There was a covered turntable here that has been removed now, although much of the snowshed covering remains. There was a whole network of buildings here connected by tunnels. In the winter the snow can be 20 feet deep in a severe winter, blocking even second story windows. This area is actually busier in winter than summer as it is the site of numerous ski resorts. 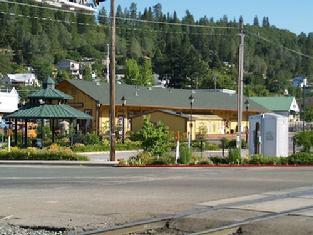 Ski trains used to be quite popular and stopped at Soda Springs to let off passengers. I'll leave a description of the summit area for later as this blog has gotten a bit long. I am making good progress on cleaning out the shed to prepare for construction. I ahve a snag though - the roof has been leaking on one side of the shed and I found dry rot on the wooden floor. I will have to repair this and fix the roof before construction can proceed!